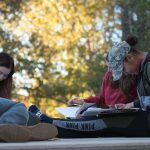 Rather than offering specific degrees, the Honors College enhances UA’s undergraduate curriculum. 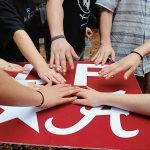 The foundation of the Honors College is the Honors Experience, which provides students with an enhanced academic curriculum and the ability to work with their peers and outstanding faculty members in an enriched academic environment. Honors pedagogy is distinguished not by greater difficulty or additional work, but by enhanced experiences that promote heightened reflection and learning. Professors in University Honors (UH) courses stress the development of critical, analytical, and interpretive skills. UH courses are the foundation of the Honors experience and often can be used to satisfy general education requirements. We have developed our Honors College requirements in a way that makes dovetailing Honors courses with your major coursework a straightforward process. The vast majority of our Honors courses meet core curriculum or major requirements, so Honors students simply engage in an Honors version of a normal undergraduate plan of study. Honors students also have the benefit of priority registration within their academic classification, which enhances their ability to create the schedule that best fits their needs. The Honors College offers two selective programs, the Randall Research Scholars Program and the University Fellows Experience, which we encourage you to learn more about.